There were plenty of leftovers in the fridge to re-heat and make a killer burrito for lunch today. 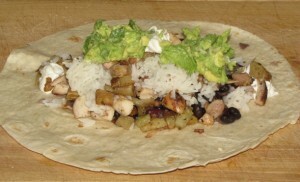 Rice, black beans, roasted potatoes and chicken along with some guacamole that I whipped up super quick. 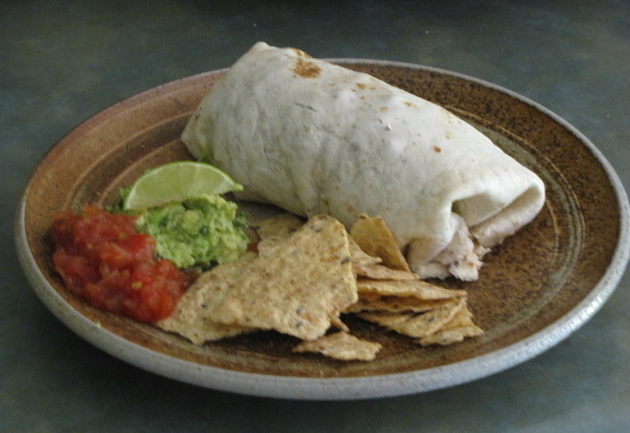 Top it off with some sour cream and cheese, roll it up, and I had a fantastic lunch. Just a quick "Good Morning" to you all and then I'm off to work. 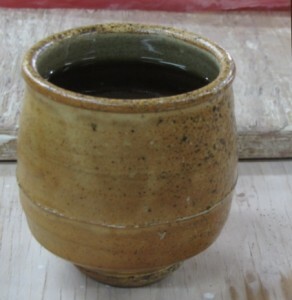 I have a nice hot brew of black tea in this yunomi by Brandon to keep my insides warm while I'm out in the studio. Hopefully I"ll have a few pots to show you by the end of the day. I spent the first part of today getting pots glazed and mixing some tests. I've got the little test kiln fired up now. I should have some new infomation by tomorrow morning. Hopefully a couple of new accent colors that I'll use in the next firing. After a break at lunch time I got a few pots made but it seemed that my brain had forgotten how to make cereal bowls. Well, I did increase the amount of clay by a half pound and it took about 6 tries before I was happy with the new pot. I couldn't get the curve right either for some reason. Anyhow I've settled on 8 for now but probably need to get back in there and crank out another 8 just for good measure. Brandon has a nice video up on his blog of him making a couple dessert plates. It's kinda funny how you can do this work for a long time and still have days that just seem really difficult. I hope everyone's had a good Monday. I think I'll go make a few more pots!